I can't believe it's May already. Only two more months and I will leave Dubai for our annual one- month summer holiday and escape from the heat. I wonder what have I done in the first four months of 2011? One thing is for sure, I never think that I have been lazy. Having said that it's easy on my part because I have two kids. Most people with two kids won't be able to be lazy, even in their faintest dreams. - planning our family summer holiday which is equal to a 2-week full time job, as holiday places need to be found and booked, planes, trains, cars, to be hired, and family that we can pester or are entitled to pester us during our well-deserved holiday have to be contacted. - last but not least: some of you may know how much time it takes to maintain a food blog: all the cooking, photographing, food writing, etc. In fact, I wish the day had a few more hours, especially in the evenings, when the kids are asleep. But tiredness is catching up with me after dinner, often sooner than I had wished for. Example: I went for a late afternoon 45-minute run at about 30C outside temperature. Bathed the kids, had dinner, and at 8.30pm I was sitting on the sofa like a vegetable, only able to watch the most mindless crap on TV before I wobbled to bed at 10pm. I guess, the heat is getting me as it is already pretty hot. But after seven years in Dubai, I got used to it. Or rather, found ways, of making the most of it as long as I can. However, at this time of the year my mind IS preparing for the long, never-ending summer heat. I find myself searching for No Bake desserts. Any raw salad recipe is worth checking out. I love the crunchiness of cucumbers, their cooling effect in a body. 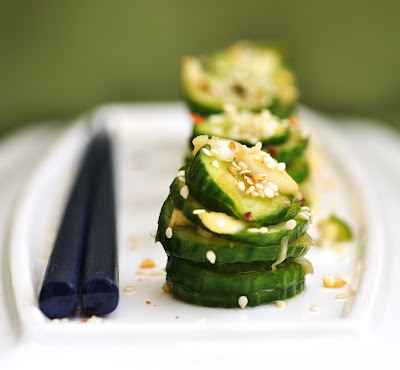 This cucumber salad is spiced up by the Asian dressing: Simple and straight, a no-fuss refreshment. Have it as fresh as you can or keep it in the fridge before serving for a few minutes for extra cooling effect. Finely chop or mince the leek. In a small bowl, combine the leek with all other dressing ingredients. Stir until well mixed. Let sit for 10 minutes for the flavors to combine. In the meantime, finely slice the cucumbers. Sprinkle with salt. Let sit for a few minutes, than pat off excess water with paper towels. In a serving bowl, combine cucumbers and dressing. Sprinkle with sesame seeds. Ready to serve.